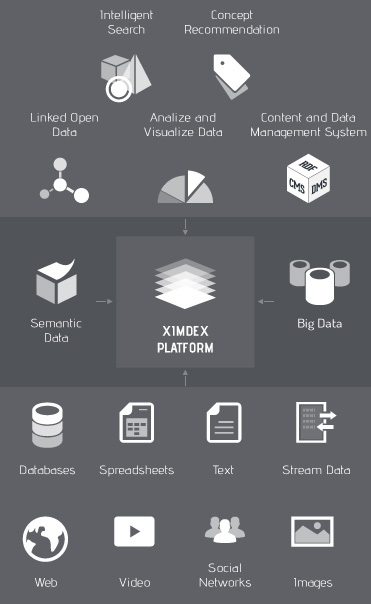 The Ximdex Platform provides tools for simultaneous management of data and content through services such as intelligent search engines, concept recommendation, information aggregators, editors, image and text recognition, analysis and visualization. The Ximdex Platform allows you to add remote sources of information, which will normalize and transform the data, creating a new model by using semantic technologies, in order to provide personalized access to the information through the products and services provided. With the Ximdex Platform, you can access your information simply and at a lower cost, allowing you to quickly mix different sources of data, improve them, transform them, and adapt them to current and future needs. These services allow you to aggregate, edit, normalize, identify named entities, enrich content, transform, expand, retrieve, and publish data, from both structured and unstructured sources. You will be able to pull relevant information, share it, analyze it, and visualize it. Use our tools to connect to remote sources of information and create a smart model for your data, automatically adding a semantic layer in order to get the best experience in information retrieval, reuse and deployment of content, services and data. Access information simply and precisely, retrieving and reusing it while saving time and money. It's based on previously-semanticized information, organizing data by concepts, relationships, smart searches, etc. XFIND: RDF, XML, indexing, ontology. The platform uses them to suggest news, reports, texts, datasets, links, or similar images in the corpus of information. Extract, analyze, and link from your data to public or private information. XOWL: NER, content enrichement and curation, SEO. Available in: Drupal 7.X, WordPress and XCMS. Publish datasets from remote data sources with real-time transformations, automatic generation of distributions and datasets, simplifying information management and connecting with new sources of information. XLYRE: interlinking, Linked Data, Open Data, Dynamic Semantic Publishing. Aggregate and update large quantities of information, establish relationships between different sources of structured or non-structured information, analyze it easily and update it using Robotic Process Automation techniques with the Ximdex Platform. XRAM: Hadoop, Spark, Elastic Search, Machine Learning. Taking advantage of the rest of the services, the multi-format, multi-channel, and multi-platform capabilities of Ximdex CMS+DMS allow you to publish on any channel of communication, deploy B2B, B2C, and B2M applications, with any technology and using a management system for semantic information that enters into the world of smartdata, managing your information with a single, integrable platform for collaborative editing of data and XML content. Visualisation of information is a key factor in content and data management. The services provided by the Ximdex Platform include tools in the cloud designed for collaborative data editing as well as visualisation and analysis. XVER: decoupled, big data, data viewing tools, semantic meta-data publishing. The public sector manages a large quantity of scarcely interconnected data that is difficult for citizens to access. They possess enormous, non-interoperable information silos that will only increase in volume over the next few years. These are two aspects of an unresolved problem, related to the inflexibility in the way the information is organized and making its localization a difficult task. Improving these aspects is a priority for government administrations, with the goal of offering clear and simple information that can be accessed from any device. Allows the information to be structured in a simple manner, adapting it to the required formats and technology. This information is published in a way that is secure, visual, and understandable, through multiple channels and for any device. The financial sector is facing new challenges in order to better understand their clients and reinforce their loyalty and commitment. To improve the online experience in a highly-regulated market where security and traceability of information are key requires increased personalization and content analysis in order to provide the appropriate solutions to the most demanding clients. Aggregate information from data silos, structured as well as unstructured. Accelerate the decision-making process by facilitating analysis of large volumes of information from distributed sources. Rapidly deploy personalized tools for visualizing, analyzing, and retrieving information. The health sector is faced with the challenge of providing the best diagnosis and treatment to its patients, at reasonable costs. In this equation, ICT systems and information analysis are more and more important. Connecting silos containing health information together is the first step, although it is even more important to extract patterns of behavior and incidences to assist in making medical decisions. Management and study of large volumes of data, guaranteeing confidentiality, security, and traceability. Exploration of patterns (demographic, epidemiological, insurance coverage...) from internal as well as external sources. The biggest challenge for the education sector is to provide a better experience when using educational resources, achieving a more enjoyable and interacting learning process. This sector is one of the largest users of semantic technology, with the object of achieving a better distribution of content, one that is better adapted to the audience, and above all, more affordable. Automatically enrich existing content to improve its re-use factor. Link it to similar resources, helping the user to find it through recommendation techniques. The mass-media industry is one of the fastest to adopt new technology, due to the fact that they are currently searching for new models of "monetization" that fit the need of their users to stay well-informed. Create new, differentiated information products. Work efficiently, taking advantage of disruptive trends. Explore new business opportunities: distribution, syndication, advertising. They use Ximdex technology to create solutions with a high added value in their fields, especially in regards to scalability, performance, and usability. 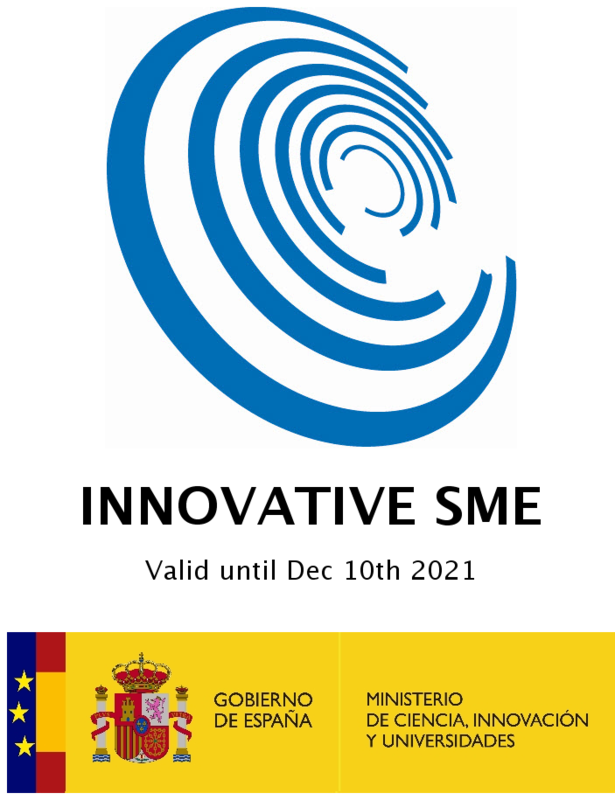 By participating in R&D projects, we gain access to emerging technologies that we are able to apply to our products, helping us to automatize the task of structuring and improving information systems, increasing security and scalability and simplifying the processes involved in data and content management . Xlabs develops innovative components and services that are able to extract concepts from texts, relate them via machine-learning techniques, or improve content by suggesting related images. Furthermore, this technology is able to identify relevant entities from aggregated information in real time. For example, this aids us in the analysis of social networks, the management of large repositories of data, and to automatically synthesize web and data portals and applications for mobile devices to help users to explore and visualize the information. These components provide the Ximdex platform with the ability to manage data and content, connect them with the source data, store them securely, transform and adapt them, share and visualize them by using concept relation filters, etc. In today's marketplace, corporations need to access information quickly and in a personalized way, with a sustainable cost. As well, they need to unify and simplify this access, allowing them to have an overall view of their business activities, one that uses all the sources of information at their disposal. Open-Ximdex-Evolution develops cloud applications for content and data management, following the latest standards of the W3C Consortium. These allow companies to manage, update, and retrieve information from their data sources, share and publish relevant and contextualized data, all in a way that is secure and scalable, accessible through multiple devices and channels at minimum cost. "Our products are developed by looking for something that adds significantly to the user's experience and by applying constant technical assistance that guarantees that it continues to be aligned with their needs"